Dubai: A grade eight student said she has secured part of her university expenses after winning a quarter kilo of gold in the 23rd Dubai Shopping Festival (DSF) jewellery promotion. Hanna Hashim became one of the lucky winners in the gold raffle held by the Dubai Gold and Jewellery Group when a coupon her dad had filled out in her name was selected out of almost 60,000 coupons. 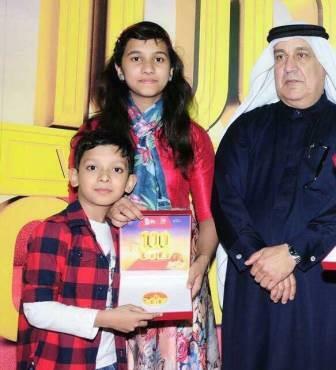 The 13-year-old, a student of Sharjah Indian School, told Gulf News she had no clue her name had been entered in the draw until she was told that she had won gold worth around Dh37,500. “I didn’t know anything about it. It was my dad who put my name in the box and then they called us up to tell us my coupon was the winner. I couldn’t believe it. It was my first time to win a gold coin,” said Hanna, unable to hide her joy and excitement. She said she knew that her parents had tried their luck several times over the years in raffles but never won. Her father Hashim K.B., a UAE resident for the last 20 years, said it was in fact a gift from Hanna’s uncles that gave them the chance to enter the draw in the first place. “Hanna’s uncles gifted her the gold necklace from Malabar Gold and Diamonds and gave us the eight tickets to fill in for the draw, but I did that only two days later because we were busy to go drop them in the box at that time,” said Hashim, a sales supervisor and father of two. “I filled two coupons in Hanna’s name and, on January 7, we got the call. As usual, you would think it’s one of the pranks, but it was not this time,” he said. Gold buyers stand a chance to win up to 33 kilos of gold — worth Dh5 million — during the 23rd Dubai Shopping Festival (DSF), which runs until January 27. The Dubai Gold and Jewellery Group (DGJG) mega jewellery promotion for DSF has been changing the lives of many people over the years. This year, a total of 100 winners will walk away with gold, including a mega winner of the final day raffle who will take home one kilo of gold. Three lucky winners will get gold prizes on the rest of the days, with the first prize winner receiving 500gm gold, and the second and third lucky winners taking home 250gm gold each. Customers purchasing gold jewellery worth Dh500 will be entitled to one raffle coupon and those who buy diamond jewellery, pearls or watches worth Dh500 will get two raffle coupons to take part in the daily draw. Raffle coupons will be provided by all participating jewellery outlets, kiosks and all terminals of Dubai Duty Free during DSF.